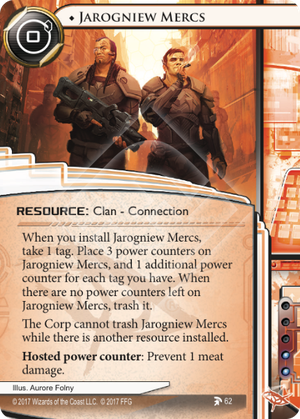 If the Runner has zero tags when they install Jarogniew Mercs, how many power counters are placed on it? Four power counters are placed on Jarogniew Mercs: 3 + 1 for the tag taken from its ability. If the Corp plays The All-Seeing I while Jarogniew Mercs and another resource are installed, what happens? The All-Seeing I attempts to trash all resources at the same time. Because there is another resource installed, Jarogniew Merc's ability prohibits it from being trashed. If the Corp plays Freelancer while Jarogniew Mercs and another resource are installed, can they trash Jarogniew Mercs? No. The Corp must pick both resources to trash first, then they are both trashed simultaneously. Since there is another resource installed, Jarogniew Merc's can be chosen but it cannot be trashed. Jarogniew Mercs is an interesting card. It prevents at least as much damage as the soon-to-rotate Plascrete Carapace but in exchange it tags you. Since you get a tag when you install it it's easy enough to clear, though beware of Zealous Judge. But the interaction with tags goes further than just giving you a tag. You can charge up the mercs by floating tags. The mercs are a resource so subject to trashing, but there's some protection here as well. If you have just one other resource installed the mercs cannot be trashed until that other resource is installed, per the UFAQ (see above) that means it's invulnerable to The All-Seeing I, unless the corp can shoot two of those at you of course. By the way, if the mechanics are somewhat familiar, that's because of Paparazzi. Paparazzi is extremely vulnerable to the corp simply trashing it though whereas the "cannot be trashed while there's another resource" text of Jarogniew Mercs is a decent defense. There's one little problem with the idea of using other resources as a shield, you actually need to use some other resources and those are vulnerable. So you need to strike a balance between playing resources that are useful enough to include in your deck without provoking the corp to come in and trash them. I wouldn't recommend things like Aeneas Informant in a mercs deck for that reason.